across hippos, giraffes, zebra, crocs and impala on the way here. The drive to Guma Lagoon, our next stop, brought this home to us with a vengeance. It took all of Stuart's driving skills to get us the 15 km to the camp far in the back of beyond, off the tar road and down a criss-cross of deep sandy tracks. If I hadn't had the experience of driving in Dubai I would have worried, as it was I was pretty apprehensive as we had not let the air out of our tires and there were marshy bits in between. 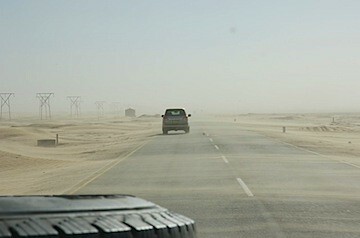 It took a long time of driving in low ratio but we got there, really aware of the reality of sand along the river now. At Guma Lagoon camp the river widened out and split, so that the lagoon is actually part of the Taoghe river rather than the Okavango, which carries on further East. The water was high, a result of the rains in the Angolan highlands, which feed into the rivers further South, filling them up four months later, so even though we are in the dry season there is a lot of water in the lagoon. The fertile areas of the delta don't reach as far out into the surrounding landscape as they do in Egypt along the Nile, but they are also not as sharply delineated, seeming to fade into the desert gradually. After a few days of chilling and capturing footage, we took a boat ride out into the swamps. We took off with our guide Cobra in a small metal boat across the lagoon at about 4pm. The sun was just getting low enough so that the light turned soft and mellow and the lagoon lay blue and flat ahead of us, flanked by green papyrus reed beds, holding unseen animal treasures. We first went down along the reeds we had seen from our view point on the deck of the camp to look at the papyrus more closely. Apparently both the roots and the inside of the stalks are edible and a bushel of reeds can be strapped together to make an impromptu boat to transport people and goods across the channels when it gets too deep to walk. So there is more to papyrus than making paper. I have been fascinated by the papyrus, as it really looks like the drawings in Egyptian tombs, only three dimensional. They are very tall, about 4 meters and have graceful feathery tops. We also saw day lilies floating on the water next to their plate shaped leaves, their petals shining white and pale blue to fading purple to pink against the dark water. The water was very clear so we could see the tangled nest of roots and dead reeds down in the depths, luckily no hippos under the surface (which can tip a boat if scared by an engine) or crocs (who are only dangerous once you're in the water - like when your boat got tipped by a hippo). As we went along the channel became narrower and the tall greenery on either side of us began to close in. The papyrus towering over us was only occasionally interrupted by islands lined with palms, Baobabs and Mopane trees, their roots holding the sand when the annual floods threaten to carry them off. In the lower tangle of stalks we saw king fisher, heron and other small birds, and later we were dive bombed by a bat picking off insects that come out in the late afternoon. Occasionally the guide would stop the boat to show us something he had discovered in the reeds, a bird or a flower or a small croc. Once the engine was cut we would drift until he managed to restart the battered old outboard. At one point we stopped next to a sandy slope between two gnarly liana-laden trees. On the soft bank lay a massive brown crocodile, probably three meters long, tail curled in, apparently asleep, looking exactly like the Peter Pan croc. It was all very exciting for us, we were taking photos and filming intently, marvelling at the size and scaliness of the animal, its stillness - probably waiting for a bird to mistake it for a log - and all the time the boat was drifting closer to the water's edge. Kobra restarted the engine, or tried to. As he was yanking the starter I felt Stuart, who was closest to land, edging towards me. Suddenly the croc, with an almighty swoosh, snapped its head around, obviously deciding we had outstayed our welcome. We all nearly dropped our cameras at the lightning fast action of this seemingly lumbering giant. We had just been discussing how something that size could be fast enough to catch a bird. Now we knew. Hearts pumping with adrenaline, we were glad to hear the engine finally coming to life, just before we bumped into shore and within range of a big and very grumpy croc. The amazing bird life has made Stuart very happy, he is ticking sightings off his list with a vengeance and when he met a fellow twitcher here in Maun he was in heaven, exchanging names and puzzling out mysterious birds he had not been able to identify. 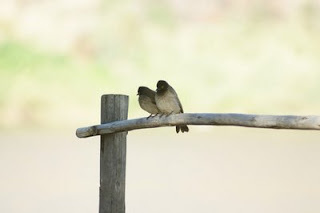 We are hoping to see more birds when we get to Moremi Park tomorrow. 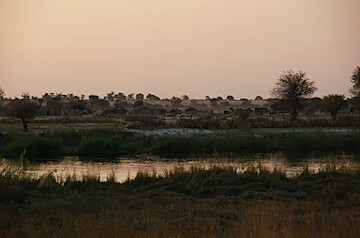 The first time I heard of the Okavango Delta was while watching the BBC series Planet Earth. A group of elephants are walking across the flooded plains of the delta on their annual migration. I had no idea then where the Okavango was or that I would ever make it there. Now we are here in Maun, the gateway to this vast region of swamps, river channels, island and sandy savannah. But there is so much more to the Okavango than just the delta, which we have been following down from before we even entered Namibia. We left Rundu about a week ago. 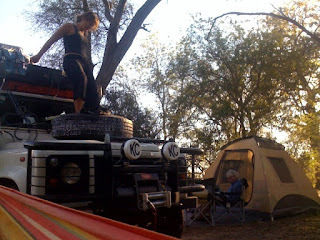 There, we were already camping next to the Okavango, called the Kavango in those parts, and the border to Angola. It was fast flowing, but narrow, lined with reed beds, and people were punting little boats across it and washing their clothes in it. We took a southwards turn with the river as we headed for the Botswana border and the Mahangu Game Reserve, a tiny reserve anyone who wants to get to Botswana has to cross. Before that we spend a few days at the Mahangu Safari Lodge, again by the riverside. The river had changed now, become wider and more sedate, and the remote side looked dark and wild and forbidding. That night was the first time we heard hippos groaning in the reeds next to our tents, and on the opposing bank. The sound sounds nothing so much as a young boy trying to practice the tuba, a queer trumpeting sound that breaks off as if running out of air. The hippos were quite invisible to us, although we spotted one across the river one night, but they are shy and luckily not very inquisitive, so we didn't have to worry about them checking out our tents. The morning mists rose moodily over the water as the sun came up, warming the tent quickly, although we always have really cold nights right now. I had hoped those would be over with the end of the desert camping, but the proximity to water makes for a lot of condensation and frosty toes in the mornings. The view of the filmy fog backlit by the strangely African yellow-orange of the rising sun makes up for any cold body parts, and a cup of tea really helps. On our way to the border we had to perforce cross the tiny Mahangu reserve, which had been recommended to us by the lovely Swiss family we met at Etosha, who described it as a 'real safari', windy tracks through bush and lots of animal spotting. So it turned out. The river took on yet another aspect here, widening out to a broad marshy flat, edged by reeds and covered in a shallow layer of water, which made it very green and a popular place for hippos. We finally got a good look at one of those grunters, who was scoffing lush grasses on the bank in perfectly peaceful union with a family of warthogs, who must have felt honoured to have their big soggy cousin eating with them, and a few cattle egrets, who like anything that might yield a few insects off their skin. So thanks to the Swiss family, if you are reading this, we loved the place! We also managed to meet up again with an Austrian family we shared a site with at Sachsenheim outside Etosha, and who took a similar route to us for a few days, so we kept bumping into each other. Stuart and the Austrian dad were actually contemplating tackling the hippo for a better photo, but then desisted. Hippos really don't like to be disturbed and are liable to run you down on their flight back to the water. The guide book actually recommends standing still and jumping out of their way at the last minute, but I'm glad Stuart didn't have to test that strategy. The open plain of the reserve reminded me how close we are to the salt pans of Etosha, the heat and emptiness, the dry dusty days there, for the utter contrast we saw only a day's drive away. This was a paradise of growth and fertility. It became clearer soon just how much the Okavango and the many other rivers of the delta make this part of Botswana, when we drove to our camp site at the Tsolido Hills in the North West right after the border. We were back in the desert, as this is actually the Northernmost stretch of the Kalahari, and I was surprised to find out that the actual delta is located on Kalahari sands. The Kalahari is actually an ex- (or fossil) desert, as it now receives too much rain fall to be still considered a real desert. Trees grow there, but mostly hardy acacias and Merula trees, grasses and small shrubs. The land the waters flow over are very very sandy, and not at all muddy or mushy as I expected. If the water disappears, as it sometimes does when the river changes course or it's a particularly dry year, trees die and the land goes back to desert. Being the geek that I am and suffering from an extreme case of internet addiction I was really concerned how I was going to be able to get my fix on the road. When my data plan ran out on my phone on leaving South Africa I was in withdrawal for days, missing my news feeds, Facebook updates and email. Stuart tried to get me a fix of mobile net in Lüderitz with a Namibian SIM card, but we never got the data working, although it was very useful for calling camp sites and such. Getting online in towns has been surprisingly easy, though. The guide book always lists internet cafes, but it's easy to tell if a town is the right size and consistency to be online. Prices vary, and usually there is no wifi, but at least so far we've been able to connect our own Macs to the ethernet cable. It makes a big difference when we can use our own machines to upload and do mail (specially with our anti-Windows bias). The first time we got online after leaving was in Cape Town, first at the Formula One hotel, and then in the lovely Mugg and Bean coffee shop at the Waterfront, where the cool staff provided me with a power outlet and endless cups of tea and didn't complain when I sat there for four hours. A lot more pleasant than the cramped quarters of the Formula One. Moving on up the coast Stuart managed to locate an internet outlet (can't call it 'cafe' by any stretch of the imagination) hidden away by a closed down restaurant, on the main road, but pretty invisible. We had a frantic one hour session, eager to get on to the camp site, and this has formed our online experiences so far. 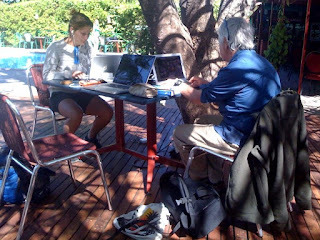 Always we swoop into a place, bearing three Mac laptops, plug in at least one ethernet cable (we can share one connection with an ad-hoc wifi network) and then it's all upload tracks, blog entries and photos, download updates, emails and podcasts, do backups and get up to date. Namibia has few big towns, so we knew we would be limited with access, so we were pleased when the owners of the Sandrose Hotel let us log into their own personal wifi. I'm afraid we bashed their bandwidth a bit, It had been a week and there were a lot of photos to put on Flickr and exciting stories to tell on the blog. The next stop with internet was Swakopmund, where we swooped on to the little wifi cafe in the Adlerpassage, a tiny place with tables out in the mall, who kindly gave us power if we didn't trip up the other customers and let us sit with one can of coke for hours. We returned there three times. Rundu was a whole different experience. We had just been robbed, and were still a bit jittery, so Rundu felt threatening and crazy. It's a proper border town, which adds to the lawless feel, and it was the first time I was glad someone was watching the car in the car park. Sparks Enterprises was busy with local ladies, but were very glad to give us some ethernet cables (only one of which worked) and power. The morning was very rushed, as Stuart had lots of problems getting online, and we were trying to get out of there quick to go to our next camp site. We were over Rundu. There is nothing much in the way of towns on the South Road from the Namibia/Botswana border, so Maun was our next online stop. Here every shop and his dog run an internet cafe, or has a few computers shoved in the corner. There was an embarrassment of riches, so we checked all the prices and setups, but didn't think to ask if there were bandwidth limits. So when we had settled down at the counter, ordered a coffee and carrot cake, we discovered that two hours of internet only gave us 40MB of bandwidth. We laugh at 40MB. 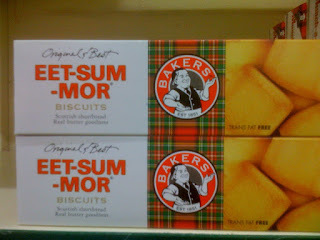 We eat 40MB for breakfast and then have elevenses. We had a word with the manager, who kindly increased us to 100MB, which surprisingly was enough. So as you can see the map and calendar have been updated, there are blog entries and photos, all for your delectation. Oh, and the SIM card from Orange set my up with data access (on Edge) automatically. Like magic. So I can get Facebook on my phone. Enjoy it while it lasts! I will. No more guest posts from Stuart, he has gone back to updating his own blog, so head over there if you want to get his take. In case you didn't realise, Merryl also writes a funny blog here. Stuart had his wisdom tooth removed in Windhoek, following a mad dash from Swakopmund, a short stay looking for a dentist with an open schedule, and a further dash on to Etosha fuelled by painkillers and antibiotics. My horse fall resulted in a doctor's visit in Swakopmund for a checkup, where the doc was impressed by my hematoma, and gave me a miracle cream for my scrapes which made them heal really fast. All that's left now is a pain in my left rib and an ache in my shoulder when I lie on it. The cough I picked up two days out of Joburg disappeared a few days ago, mercifully. Merryl managed to evade any injuries so far, barring a few splinters, but has suffered from swollen ankles and a stomach bug for the last two days, which has prevented her from seeing the Tsolido rock art. The car acquired a new dent in Abiqua when Stuart tested the high lift jack on some slippery ground, but we were glad he did, as we were able to easily fix the slow puncture we got on the gravel track to Naukluft when we picked up a bent piece of wire. Thanks to the tyre shop in Swakop that was fixed for the reasonable price of N$63 - about 7€. 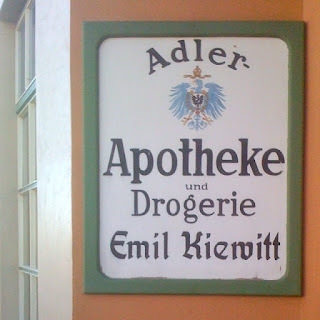 I was expecting Eisbein and Apfelstrudel in Swakopmund, a town everyone told us is more German than Germany, but I was not prepared for what I found. There were German magazines in the doctor's waiting room. German sweets for sale in the supermarket (yay for Katzenpfötchen and Blockmalz). There was a Poststrasse and a Bismarckstrasse. 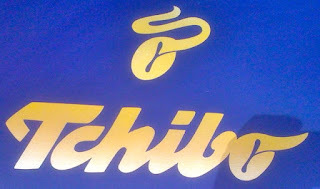 Everything from the optician to the Apotheke was signposted in German, the service improved immeasurably once I started speaking German to people, and then I came across a Tchibo shop, and my German experience was complete. Warning: This blog entry contains many German words. This is intentional - I haven't suddenly lost the ability to write the English language. If you want to know what they mean, look them up. After Etosha we are heading to Botswana, via a small town called Tsumeb. The savannah of Etosha had given way to woodland and some hills, the trees showing an amazing range of colours in their leaves, from bare grey branches to reddish brown and dark green leaves, silvery shades and yellow leaves where the sun has bleached the growth. 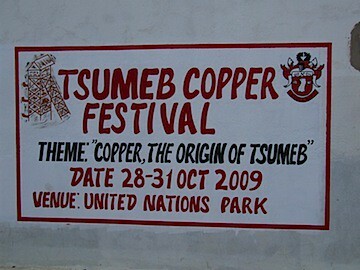 Tsumeb is a small mining town with a very big mine. The mine had closed 18 years ago and the town was now trying to find a purpose serving the farming community. Mining in Tsumeb was for minerals, metals and crystals, a crazy mix of materials pushed up in a pipe during the making of the world. MAny minerals are only found here, and the crystals and gems have made-up names like Tennantite and Anglesite, or sponsored names like Smithsonite. Down Main Street, past signs for the Copper festival, the Youth Festival and the banner announcing Karnival (at the end of July?!?) we came to the jewel of the town, the Tsumeb Museum: "Ethnological-colonial and mine history under one roof!". Entering it I found myself returned to the old Heimatmuseum in Bottrop, with an African twist. The lady at the desk spoke German, of course, and the rooms were labelled in German, Afrikaans and English, displaying the utterly complete German influence on the town despite the fact that the Germans surrendered to the Brits in 1915 and never regained Namibia as a colony. The museum rooms resemble nothing more than the average German Heimatmuseum, polished wooden display cases filled with dusty, badly labelled artefacts: diaoramas illustrating 'traditional life' (in this case a Herero village) built from found materials by a volunteer, trees fashioned from cotton balls dyed green and held up with brown sticks; fading photographs and educational writing taped to the walls; jewellery displayed on inappropriately coloured mannequin heads; old medals and war uniforms labelled with the donor's name. The 'mine display room' was copied directly from the Bottrop museum, showing as it did the mine worker's implements, a Gesellenstück made for an exam in the shape of a parrot, but really a cigar cutter; charts and maps of the mine payout, models of the mine workings and photos of Victorian families and their black servants at Christmas. Then there were targets from the Schützenfest, medals from the Reit und Fahrverein, trophies for the Kegelmeister, a banner from the Männerturnverein and costumes from the Karnevalsverein. Also Pfadfinder flags and Mark pieces of the official Otavi mine currency, to keep people's pay in the family, so to speak. 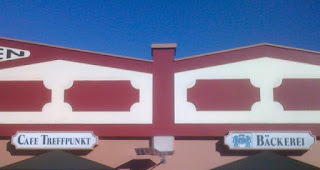 It could not have been more German if it tried. We left Tsumeb eating Apfel und Karottenkuchen from the Etosha Cafe and Biergarten. All over Namibia we have been seeing trees which seem to have been draped in straw. However, on closer examination, you see that there are dozens of small birds flying in and out of this pile of straw. These are the nests of the Sociable Weaver', a species of weaver bird that, instead of building individual nests for each couple, gets together and build a tower block. The birds themselves are unremarkable, but quite cute. Here is a young one. 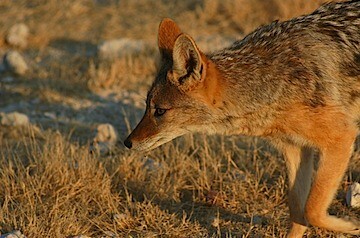 Etosha has been one of the most anticipated places for us to visit. We have heard about the salt pan, the amazing amount of animals that can be seen there, and the beautiful savannah. We planned to spend four nights in the park, the longest we have stopped so far. As usual, it turned out different. The park and camping fees had gone up to twice the price of the two year old guide book listings, so we kept our camping there to a minimum. The salt pan was eerie and empty and vast, but also very smelly and covered with the stickiest substance known to man, a stinky grey mud that stuck to our feet and boots and took us half an hour to wash off in the evening. We did have some amazing animal sightings, though, thanks to the brilliant waterhole right next to the camp, flood lit at night. The animals seemed to not care about us, although I could swear that the elephants were looking right back at us trying to figure out what we were doing staring like that. On our second evening elephants and rhinos came out for a testosterone fuelled display. First there were two male elephants who spent more time pushing and shoving than drinking at the water inlet, which seems to be their exclusive domain. Maybe the water is cleaner there than in the main pond. Dangling their huge penises they repeatedly shoved and bumped and groaned in slow motion as if to prove some plodding and mysterious point. Later two black rhino wandered out of the night to drink on the other side of the pool. All was peaceful until another group of three elephant bulls arrived from the far side of the water. In order to get to their brethren by the water pipe they had to walk around the rhino. There was a lot of ear flapping and head shaking as the large bull passed the rhino which seemed to reverse to try to block his path (black rhino have a reputation for being irritable and aggressive - next to an elephant it's probably small guy syndrome). After a short stand-off the rhino wandered off. Of course the second rhino now took offense and tried to take on the same bull. This one lost out like the other rhino, but instead wandered into the water as if to say: I might have to give in, but I can still piss in your drinking water. The gang of three newcomers went straight for the two incumbents, who gave up their own tussle as they were now chased off by the big new bull. There was a lot of to-ing and fro-ing until some sort of equilibrium was established and the two smaller bulls stood off to one side to let the newcomers get their fill. The next morning we drove through the park, and watched a lion/warthog encounter. Two young males were resting by a waterhole, spread majestically like statues at Trafalgar Square, when a warthog blithely stepped out from the bushes. He noticed the lions, but must have thought he could safely pass through them, because he ran on towards the water. It was when one of the lions stretched out leisurely that the warthog must have thought better of it. He turned on his heels to find alternative refreshments. Up before 7:00. Drove down the road to the supermarket for a quick shop at 8:15 and then on to the abandoned Diamond mine at Kolmanskop. This was once a thriving place and a solid infrastructure was built there. It was then abandoned and became a ghost town. We started in the main hall, and associated rooms such as gym and kitchen, which has been renovated and took many photos before looking at some of the abandoned houses. It was rather strange and a little sad. I looked around one of the houses which was in pretty good condition almost as a potential buyer, checking out the sizes of the rooms! It was then a long drive to Sesriem where we thought there was space. However, the number we called was for a different campsite as the numbers have been switched and the guide book is wrong! The Sesriem campsite is very popular and was fully booked. However, there was space in the overflow area which was well away from the facilities but not too bad. What did shock us though is that the price charged for us three and the car was ZAR750 per night, plus we had to pay a park fee of 250! This was well over what we expected to pay so we only booked for one night. Set up camp, had dinner and looked at the stars (again a remarkable display) and then to bed. Up very early to visit Soussvlei - where the dunes either side of a river have come together to block it and so it cannot get to the sea anymore. The result is a salt pan (or vlei) surrounded by amazing red sand dunes. We were pleasantly surprised to see there was a tarmaced road to Soussvlei (maybe that is why the prices are so high at the campsite) and we covered the 64km to the 2WD car park quickly. The last 5 km is for 4WD only so I selected low ratio and diff lock and went for it. Driving on sand again was fun and we never felt we were going to get stuck even though we had not let down the tyres. We arrived at the final car park and there were only 2 others there before us. The dawn light was beautiful. I wired myself up and Merryl and I climbed a large dune by the pan, with me talking to camera a lot of the time. I think the footage will be good. Fiver did not come with us as she is still sore from her fall from the horse. However, she had the kettle on as we returned. During our walk we saw an oryx close to the car. It only had one horn so it looked a little strange. Merryl took Fiver to see it as I made the tea. We had breakfast here, having fun photographing many sparrows for whom we made mini water-holes- they liked being fed as well but we very keen on water, not surprisingly in this incredibly dry area. We headed back to the campsite and tidyed up. We then set off for the short trip to the campsite we had originally booked last night! This was a bumpy journey on the least well treated roads we have experienced so far but they were not too bad. The last part of the journey through hills was particularly beautiful. Once we had set up camp, Merryl and I set off to do a couple of hours walking along the Waterkloof river. We got about half an hour along it when we came across a colony of baboons. Merryl was a little spooked by them and did not want to go past them so we returned to the campsite and then set off in the other direction along the river. It was a beautiful but not so easy walk (and I am finding Merryl's youthful fitness hard to keep up with). We even came across a rock pool in this river which actually had a fresh water crab living in it. Back to the campsite for a lovely meal of sweet corn and vegetarian chilli con carne with tortillas. It was very cold so we went to bed early. Before doing so I noticed once of the tyres had gone flat with a metal spike sticking out of it. Nice job for the morning! Up early and saw that the tyre was now completely flat (which explained me rolling onto Fiver all night!). Went off for a fun with Merryl which was doubly hard. Firstly, the track was very hilly and, secondly, it was a few degrees below freezing. We got very cold and it took me a long time to get warm afterwards. When we returned from the run, Fiver had already put the tent away so we started on the tyre changing as we made breakfast. It was hard as everything so so cold. We used the hi-lift jack with pneumatic jack back up. We did the job rather easily in the end and got away not too late. The drive to Swakopmund was another glorious experience through amazing, empty countryside, including a couple of mountain passes. We stopped in Solitaire - a one horse town, that was recommended for great apple pie baked by a guy called Moose, who basically ran the place. The apple pie was very good and as we took it out onto the lawn to eat we met a New Zealand couple called David and Heather, who were on holiday. We had a good chat. At one stage in the journey we crossed the Tropic of Capricorn and, like the contents of two overland tour buses, we got out to have our photos taken at the road sign. As we approached Walvis Bay there was a dramatic change to real sand desert conditions, with huge dunes coupled with a sandstorm blowing sand over the road, which we had last seen in the UAE. As we got close to Walvis Bay we saw a train that was stopped while labourers cleared the tracks of sand. We did not enter Walvis Bay but turned towards Swakopmund, passing the many smart developments on the coast between the two towns (but why anyone would want to live in these conditions is beyond me). 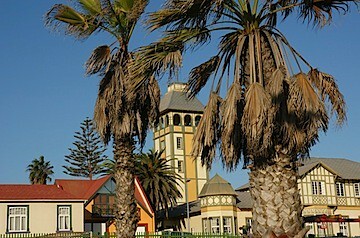 On entering Swakopmund we tried the Municipal Rest Camp, that had many cheap bungalows but it was fully booked. We, instead, went into the Alte Brucke campsite that had places on grass with their own little bathrooms attached. It felt a little like camping on the lawn of someone's house in suburbia, but it was very comfortable. Up early for a lovely run along the sea front at dawn with Merryl. Afterwards, we embarked on a day for doing chores. We did the laundry, got the tyre mended, did some shopping and spent plenty of time on the Internet. Fiver also went to the doctor to see to a pain she had in her ribs following her fall. I also tried to find some US dollars that I failed to do in Cape Town, but this time even though I could change money, no bank had any. Seems I need to order them a couple of weeks in advance, or be lucky that someone had changed dollars for Namibian dollars and the US ones had not yet been sent to Windhoek. One bank (Bank Windhoek) promised to call us tomorrow if any dollars came in. Whilst Fiver and I spent the morning in town, Merryl headed off to the dunes and did some sandboarding - bit like snow boarding but with the big inconvenience that you have to walk up to the top of the dune rather than go in a cable car! I think she got quite worn out! During the afternoon we bumped into David and Heather again and agreed to go our and eat Eisbein (knuckle of pork) that evening. 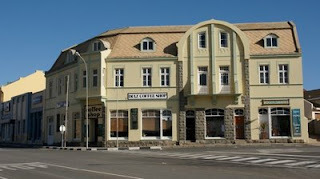 We suggested the Swakopmund Brauhaus and agreed to meet there at 6:00 but when we tried to book found it completely booked out. So, we tried other places and one rang around for us and got us booked into the Wild West restauarant that had some. So, we hung around the Brauhaus until they turned up and we walked to the Wild West place. In the end we had two Swine Haxe and one Eisbein between us (they are the same thing except the Haxe is roasted and the Eisbein is boiled). We had a fun evening. Up early for a run on my own (Merryl was sore from the sand boarding). Later went into town for more chores. One of which was continuing my quest for USD for our proposed visit to Zimbabwe. Went into Bank Windhoek and found they had around USD800 which they agreed to sell me. Had to get cash and got frustrated that my New Zealand cash card only works at one of the banks (where I promptly went and left it in a machine!). Also found my Lloyds card had been blocked as I had used it in Namibia and their sophisticated computer system assumed it had been misused - how much do I hate banks when I travel - they cannot cater for people such as us as we have a spending pattern that their systems cannot cope with. At the end of the afternoon I went off on my own for a couple of hours, trying to capture photographically the essence of the town - and was quite pleased with some of the results. Returned to the camp to help get ready for a quick get away tomorrow morning. Once done so we went into town to the local cinema to see 'Angels and Demons', which made an interesting change. Crazy day. Could not sleep during the night due to a tooth ache from my wisdom tooth that the dentist in South Africa thought would be a good idea to remove. I ignored his advice and paid the price. So, when we got up I told Fiver the problem and we agreed to head to Windhoek rather than Etosha, or rather then staying in Swakopmund, as there would be plenty of dentists there. So, up at 04:30 and away before 05:30, It was a relatively straightforward drive to Windhoek with Merryl and i sharing the driving while Fiver slept. Before we got to the City Fiver called ahead and found a dentist who could see me at 2:00pm. We headed for the area of the dentist but stopped at 10:30 by a Telecom office and found a phone book. We called a few dentists and got one who could see me immediately who was not too far away. We found the place easily and I was attended to be a young lady dentist. After a couple of x-rays we agreed to remove the offending tooth which she did quickly and painlessly. As ths was all over by 11:30 we decided to battle on to Etosha. It meant our longest driving day to date (821km) but the driving was easy, all on straight, fast tarmac roads with little other traffic. 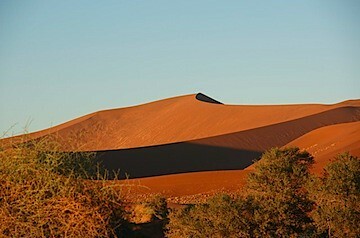 We reached the gates of the park about 4:15 and drove slowly the remaining 19km to the camp we had booked for the night. On the way there we saw zebra, springbok, jackal, a distant elephant and many giraffe. This was very exciting for Merryl, her first sighting of giraffe in the wild. Etosha is a very large national park, spread around an enormous salt pan. The salt pan does not support much life until it gets the occasional flooding but the area around is home to a very large amount of wildlife. The office at the camp showed the usual African efficiency and I was getting annoyed - I was very tired by this stage. Eventually it was sorted - we booked in for two nights (for the crazy price of N$1500 for the two nights). We had planned to move on after one night but we found that the next camp we had planned to visit (Halali) was fully booked. We found our camping place but there was another car parked there and we found that the site had been double booked. We were offered another place but did not want to find that that was also double booked so we stood our ground with the hapless park official who found the owners of the car and they agreed to move, despite having arrived earlier than us. I was being unreasonable but I was very tired and stressed. We set up camp quickly as it was getting dark. As we were staying 2 days here, tried putting up the ground tent but the ground was far too hard so we decided to use the roof tent instead. We then moved to the floodlit waterhole where we had a wonderful experience watching elephants, giraffe, springbok and jackals. Then back for supper of soup and to bed. Up early, before light, as usual. The jackals had been around during the night and they had eaten the straps off the bag of the packed ground tent, which we had left outside. Merryl also mentioned that one played with her tent for sometime during the night, which was a little scary. After Merryl cooked, and I ate, a meal of beans on toast we set off for an early morning game drive. I drove initially, with Merryl in the front for her first game drive and Fiver in the back filming. We headed north west and were rewarded with many animal sightings, including very many zebra and springbok, several Blackbacked Jackals, giraffe and yellow mongoose. 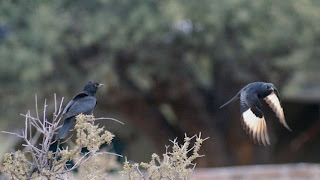 Among the birds, besides the many Sociable Weavers (there are a lot of their huge nests in the park) we also saw Fork-tailed Drongos, Cape Glossy Starling, Black-shouldered Kite, Crowned Lapwing, and a couple of Kori Bustards. We returned around 10:30, did some quick shopping and chilled around the camp. Had a couple of visits to the water hole where we saw many Zebra and Elephant, along with a Blacksmith Lapwing and some Pied Crows. We did not go out on another game drive in the evening but did visit the water hole and sat for a while with a beer, taking photos and video. Back to camp later for a quick stir-fry and then to bed. Up before dawn for a long game drive. 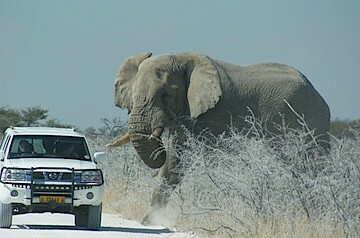 As we cannot get bookings at any other camp inside Etosha we need to get out of the Eastern entrance tonight. We were up at 5:30 and packed away by 06:30. We drove out into the park and, instead of the direct route towards the Eastern gate, we took several loops. New sightings today were rhino, elephant (one of which took exception to a car being in the way of where he wanted to cross the road! 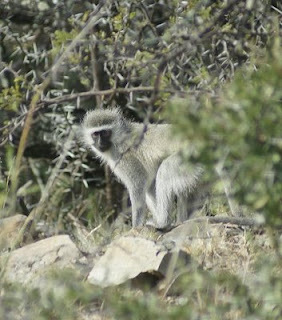 ), a couple of sightings of Lion (a pair of males by a water hole and a male and female just chilling in the bush), Dukier or Dik-Dik (not sure which). In the Namutoni camp, where we stopped for a drink and look at their water hole in the late afternoon, we also saw many Banded Mongoose. We popped into Halali camp in the morning for a coffee, but it did not seem a very inviting place so we are now glad we did not get a booking here. After this, we went to a short drive onto the pan lookout. It was completely bleak out there and the pan itself was very smelly with very sticky mud which caked our shoes. Mid afternoon, we stopped at the Namutoni camp, a wonderful old German fort now turned into accommodation and a camp site. We we stopped here for a drink and look at their water hole in the late afternoon (where there were several wildebeest drinking, along with several water birds). We also saw many Banded Mongoose around the site. We drove out of the park (which took a little while as we had lost our receipt for the park fees) and drove to a much cheaper campsite called Sachsenheim, which caters for visitors to the park. The site was attractive and efficiently run (by Germans, of course!). We had decided on a chilled morning so could sleep in a bit. We cleaned up camp and Fiver made us all pancakes. We left around 10:20. First stop was Tsumeb, an old mining town. We went to the well appointed local history museum which told the story of this very rich mine, along with a good anthropological collection of artifacts and photos (this was an area occupied by the San) Also stopped at local coffee shop called "Coffee Shop und Biergarten" to get some cake to eat on route. Roads here are very straight and a little boring to drive. Eating has become a good distraction. Stopped in Grootfontein for fuel before tackling the 260km almost totally straight road to Rundu. Not far from Gootfontein we were stopped at an agricultural inspection point in the large cattle control fence that runs through Namibia. After this fence, things changed quite dramatically. Instead of the very large white owned farms with very few settlements, we entered the Africa of subsistence farming, with many small populous villages strung along the roadside. 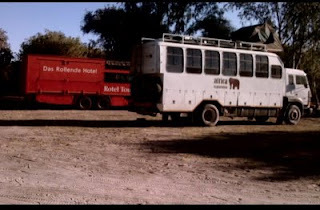 This continued all the way to Rundu where we stopped for the night. We checked into the Sarasungu River Lodge campsite. This is a lovely shady spot, full of tropical vegetation on the banks of the Kavango River. 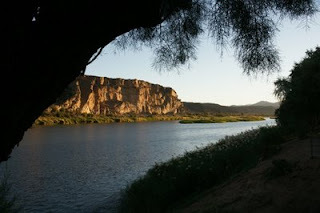 This river marks the border of Namibia and Angola and we sat and watched the sun set over Angola before having dinner. One of the pieces of warning we have been getting from the very beginning of talking about this trip has been that we will have to protect our possessions as everywhere there is a chance of stuff being swiped. So we have locked the fuel canisters, padlocked the roof boxes, locked the gas bottle to its holder and had locks fitted to the cupboards, drawers and storage spaces. In the meantime we joked how the first time we will get mugged will be in Italy, and people told us stories about muggings in London, Stockholm and New York. Today we lost our mugging cherry. We had been camping in a lovely spot right by the Okavango river, across the border from Angola, all by ourselves at the slightly disheveled camp site. It had been quiet, the only visits had been from an owl, a bush baby and the dog with six super cute puppies. Oh, and the guy sitting watch by the fire all night. Stuart brought him a mug of tea and some soup, but we lacked a common language, so couldn't work out if he was guarding us or keeping out the riff raff from across the river. He left this morning, having scrubbed the pot and cup we lent him to within an inch of their lives. I wish he had stayed: We had a dawdly morning, eating breakfast, showering, charging laptops. We were round the site most of the time, but there must have been a moment when Stuart went down the path, I was in the toilet and Merryl in her tent, when someone snuck in, climbed the ladder of the tent and grabbed everything in it. Two bags and some clothes, ready at the edge of the tent to be packed away for the day. We can't have been out of sight for more than a minute, and heard nothing. Luckily all that disappeared was our two favourite Crumpler bags, but nothing of value was in them, and the clothes had been wearing the day before. We first thought our phones had gone, but luckily we had just mislaid them. The camp site people were very good and sent out a search party, but all they recovered were some kid's size foot prints and some tablets that must have dropped out of my pocket. I was a bit worried at their enthusiasm, the gardeners who went off in hot pursuit were carrying machetes, I hoped just as that's what they were working with at the time. So now we are a bit shaken, but trying not to let the experience get to us. We will certainly be a bit more careful in future and appreciate the car guards at the shopping centres more than we did in the past. How many pairs of trousers do you need for a six months trip? How much tooth paste? Do you really need to take paper clips? What about an extra USB cable? DVDs for entertainment? Spare sleeping bag? Packing the right things and not any more has been hard, even though we have been camping for years. This trip has other challenges: we have camera gear, dive equipment and lots of recovery paraphernalia for different kinds of emergencies, we are packing for six months, not three weeks; we have no idea what the deal is with getting supplies en route. We have had so much different advice about buying replacements throughout Africa, that we can get everything along the way, that we should pack extra supplies as there is nothing between the mayor centres, it's hard to know how it's going to turn out. Plus there are three people on this trip, not two. We are well fitted out, with built-in cupboards on both sides, metal lockable boxes on the roof, and sliding drawers accessible from the back, so there is a space for everything. But as it turns out we just packed too much of everything, and we were too optimistic about the space we have. Filling everything up right from the start made it annoying to get to stuff when we needed it, and it seems that what we need during the day is hard to get to, and what we need at night a completely different set of items - is buried under a lot of stuff, too. So a few days ago we started thinking about shipping some of the things we don't really need to Germany, and as it turns out we are quite happy to lose some of our dive gear, which we can hire when we go diving. It's nice to have your own gear, but a little optimistic when there is so much else to carry. We have also dumped some clothes on the principle that we can always wash,. and that camping means it's acceptable to have stains on your shirt. Finding the right way to ship to Germany has been a bit of a slog, though, as our first option, DHL, has given us so much grief in the past, and now wanted to charge us 400€ for 20kg. 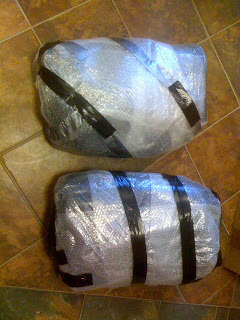 Luckily NamPost came to the rescue and a very efficient and unflappable woman behind the counter helped us find packing material and found the cheapest way to ship, costing us only 120€ for 30kg. It'll take four weeks, but since we are not there till January, we don't really care. Let's just hope everything arrives in one piece. We have been blessed so far with a supermarket in the most unlikely places, and so far we have managed to stock up at regular intervals. I am not sure that is always going to be the case, so I try to make sure that we have some of our favourite foods in store: vanilla tea bags, chilli sauce, olive oil. But it's already becoming clear that the urban necessities are going to be hard to come by. i have been looking for parmesan cheese ever since we left, so I could make lemon pasta, but no luck. Sour cream for chili wraps, no dice. But hey, we're flexible, so we are big on corn fritters at the moment, and we convinced Stuart to try some butternut squash, which is all the rage in the remote fuel/shop places. For many people, when we told them we were going to travel across Africa, the big thing was: where are you going to put all the food, as you won't be able to shop along the way? 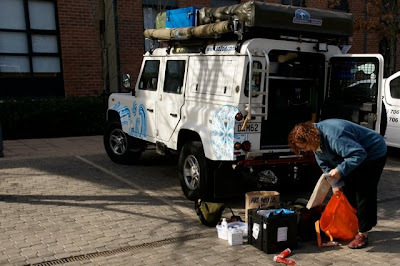 We of course have no idea what it's going to be like, and we have not really left the very civilised and inhabited places of Southern Africa yet, but we are hoping that wherever there are people we will be able to get food, of some description. The trick is to be inventive with the menu, kind of like ready-steady-cook with potentially mysterious ingredients. We've been eating these for more than a week now, today finished the last one. Bought for 10 Rand at the side of the road somewhere north of Cape Town. It was like having a never-ending bag of vitamin C. They were so yummy, we are going to get more as soon as. Answers in the comments, please. Keep it clean! If you look at our map you will see that we have just about returned to the same latitude as Johannesburg, so really we are back where we have started, only 12 days on a little further to the left. It's been a lot of driving so far, and it makes for a very peculiar daily rhythm. Now that we have a little more leeway as to getting to a certain border on a specific day (the next deadline is not till our entry into Tanzania, where we have a visa for September) we are planning our route so that we don't drive for too long every day and that we have off days where we stay in one place for more than one night. In our initial planning we realised that a trip like this can easily take a year or more, as there is so much to see and do, and we are constantly dropping interesting locations or activities so that we can properly enjoy what we do see with enough leisure so that we are not just rushing through. We get up at 6, way to early for me, but as the other two are real morning people and it helps to get the most out of the day, we are ready to go at day break (driving at night is not recommended in Africa, and we have already encountered a huge Kudu bull at dusk and a herd of springbok flowing across the road like frightened ghosts with shining eyes before sunrise one morning, all accidents waiting to happen). That usually means I grump around a lot while Merryl cheerfully makes breakfast and Stuart get a cuppa going. We pack the tents and kitchen - the car is packed the night before, so there is not too much faffing in the dark morning - and set off. After an hour or so we stop for breakfast. At the moment this still means finding a nice sheltered place to stop, as the morning temperatures are pretty un-tropical, another cup of tea and some cereal or if I am awake enough, scrambled eggs. After that we drive. The landscape rolls out from unter us, the road ahead is usually a long straight one and the country changes as we pass. Today we went from mountainous canyon land to eroded red hills to valleys covered by yellow grass like a blond crew cut; to Barchan dunes marching across a field of gravel; to end at the seaside town of Lüderitz on the Atlantic ocean. A drive of just over five hours. Sometimes we stop, to top up with diesel - Namibia, being an empty country, is not blessed with regular petrol stations, so we take it when we can get it - or to shop. Like the other day, driving up from the Namibian border: We stopped at a Spar supermarket in the middle of nowhere. Well, not quite nowhere, as there was a vast vineyard nearby, not producing wine, but grapes for export, and its attendant 'informal settlement' of workers living in corrugated iron shacks and straw huts. Everyone has to eat, so the supermarket was surprisingly well stocked. There was more than just the obligatory butternut squash and few onions on the vegetable shelf, and we had a range of lollies (sweeties, for the non-kiwis) to choose from. The place didn't stretch to Parmesan cheese, and was out of milk, but we can handle that from our stocks. Sometimes we stop for lunch, or coffee, but rarely to go for a walk or just to sit. I guess the getting-on is still too compelling, and I am looking forward to a time when we can be in the place that we find ourselves and just look around without thinking about the next new thing. We take turns driving, and so far passing the time as a passenger has not been an issue. There is a lot going on outside the window, or there are blog entries to write, photos to download and guide books to read. By the time we get to where we are going, we may be stiff in the joints, but so far we haven't been bored. Of course, the roads have been good in South Africa and here in Namibia, so our entertainment options and comfort level may well change as we get into rougher territory. We try to get to a camp site by 4 or 5 at the latest. It gets dark early during the African winter, by 6 it's all over as the sun drops so fast and there is little in the way of dusk. It's light, then it's dark. We pitch the tent, put up the roof tent and set up the kitchen. If there is time, we do some clearing out of the car, sorting the accumulated clutter of the day. If there is more time, we have a shower or go for a walk. Dinner is early, it's much easier to cook with some daylight left. After dinner and washing up and putting the car away it feels like midnight, although it's only 8pm. Bedtime is early, so the others can kick me out of bed at a wholly unreasonable time of 6am the next day. Up early for a run - ran for half an hour to Company's Gardens and back. The Gardens were pleasant but the run to and from was not so good on major roads - good job it was Sunday. Then back to prepare our kit (and the new underwater housing for the video camera) for the diving today. Got it all together and then set off by cab to the the Two Oceans Marina on the Waterfront. Got there very early but as we were the only people diving today we met up with the guide (Matt) and went and got ready. We booked two dives - one in the large Predator tank which had Ragged Tooth Sharks, Yellow Tails, Turtles and Rays, and one in the Kelp Forest tank, which had smaller sharks and other fish.We kitted up and I borrowed a 'chicken suit' - covering the chest with a built in hood, as we were told that the predator tank is kept at 18 degrees and the kelp forest at a chilly 14 degrees. We got into the predator tank and sank to the bottom. Immediately Merryl started filming with the video camera and Fiver started taking photos and small videos with the Sony stills camera. We spent around 30 minutes in the predator tank, looking at all the fish and at the humans the other side of the 27cm thick plastic walls. I was getting chilly towards the end of the dive and, after we got out, we had to clean the water from our kit and ourselves so had hot showers while still in our wetsuits. For the second dive the other two also got a chicken suit to keep warm. The kelp forest tank was much smaller and cramped and very cold. We fed the fish in this tank with cut up smaller fish (seems wrong somehow). That was fun but after that I was pretty cold and we all agreed (except Fiver) to get our after 20 minutes. Hot showers revived us and we then left our kit to dry in the sun as we went to have lunch in the aquarium cafe. We picked up the kit and took it back to the cafe where Fiver stayed and looked at the footage and write her diary while Merryl and I went off. She went to look round the shops while I got money out of the ATM to convert to USD for the remainder of the trip. Once all done we returned to the hotel by cab and hung up all our gear around the car and in the room. Then Fiver captured the footage while I had a short nap. After that we went out again to the Waterfront and had a pleasant dinner at a restaurant called 'Wang Thai'. Trip Day 7 - Cape Town, Clanwilliam Up early to pack up the room and all the drying dive gear which had been hanging around since yesterday (Fiver and Merryl) and for me to catch up on emails and finances. We had planned to then go on the cable car to Table Mountain but it was raining with low cloud this morning so we did not bother. Did all this before 9:00 and headed to the Waterfront again for breakfast and find an Internet Cafe for Fiver to continue improving the website and blogs. Went to Mugg & Bean who have wifi in all their cafes. Fiver made good progress with her tasks but I failed miserably with mine. Yesterday I got out moneyto change into USD so we had some when we went to Zimbabwe and beyond. However, no one would change it as I could not prove how I came by it (seems you should keep your ATM receipts). Very frustrating.When we had done all our tasks we drove away from the Waterfront for the last time and headed onto the N7 and drove north. We had hoped to stay in the Cedeberg Wilderness Area but the campsite had been damaged by weather and was closed. Instead we found a site near Clanwilliam which had vacancies. 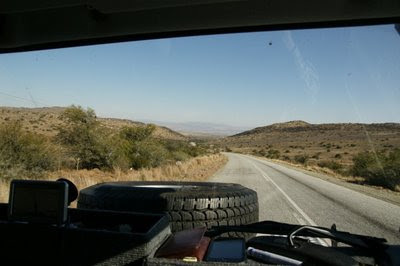 The weather improved as we got away from Johannesburg and the sky was clear by the time we got to Clanwilliam. We found the site, on the edge of the river, and set up camp and had an early dinner. Place is pretty basic and the owner does not seem to be onsite to pay! 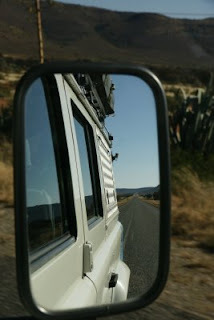 Trip Day 8 - Clanwilliam, Noordoewer (Namibia) Up at 7:00. Everything very wet from the heavy dew. Packed up and had breakfast slowly and did not get away very early. I was keen to get on as usual as wanted to get across the border today and to Fish River, which is over 100km beyond the border. The road (N7) was good and traffic light so we made good progress. We stopped for refuelling and comfort breaks, having a longer stop in the town of Springbok to use the Internet cafe, add more fuel (I also filled one of the jerry cans now we are in Namibia). We stopped for lunch a little outside the town on the roadside, next to an attractive rock outcrop. While there, we also dried out our towels and fly sheets, which dried very quickly in the hot sun. We arrived at the border post at Vioolsdrif at the same time as an overlander truck/bus, so it took a little time to get through. On the South African side we had to visit immigration, customs and police in that order. Once our passports were stamped by immigration, the rest was just the stamping of a form we were given but no checks of any sort. 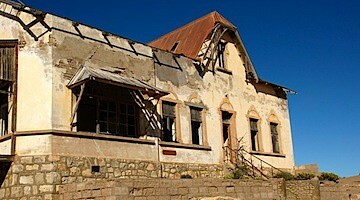 On the Namibian side (Noordower), there was passport control and a room for owners of vehicles. Once my passport was stamped I went in there, filled in a form and got a permit for ZAR180 which I have to give up when I leave the country.As it was getting late I did not want to drive on to Fish River as planned, but looked in the guide book and found a delightful place on the Orange River called Abiqua River Camp. We were given a lovely spot by the river and we had glorious colours on the rocks on the other side of the river as the sun was setting. Merryl cooked a stir fry and we got drinks from the bar to have with desert. We have already decided to stay a second day rather than moving on to Fish River tomorrow. Spent rest of evening looking at stars and photographing night shots. Pleased with the results Trip Day 9 - Noordoewer Not travelling today after all the efforts of the last week. Merryl and I got up early and went for a nice run at dawn (half an hour - around 5km). Rest of day spent in camp, taking it easy, not doing much at all. Photographed some birds during breakfast time. In the late afternoon, Fiver and I took a rubber boat out on the Orange River to take some photos. We could not paddle together for toffee so Fiver took over and I took photographs. Got pretty wet. Trip Day 10 - Noordoewer, Canon's Roadhouse, Fish River Canyon Again up early for a morning run - did same as yesterday but met Fiver on way back who was doing a walk. 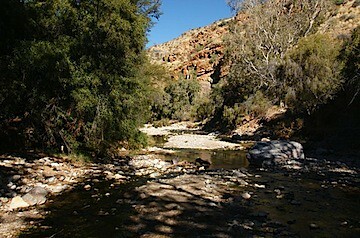 After cleaning up and breakfast we set off for the relatively short drive to Fish River Canyon. It was a pleasant drive on empty dirt roads, including one graded on the bed of the Gamkab River. We stopped at Ai-Ais to have a look at the resort but, as advised by the manager of Abiqua River Camp yesterday, it is currently being upgraded (by some New Zealanders - perhaps they know more about volcanic hot springs resorts than other people!). There were many fit but exhausted people about who had just finished the 5 day walk along the Fish River Canyon (Ai-Ais is where the walk finishes). We drove on and stopped for a pleasant lunch beside the road, before arriving at Canon's mid afternoon (our earliest stop yet). We set up camp (including us putting up the ground tent for a change) and then had rather early sundowners (G and T - we bought tonic from the bar of Abiqua River Camp. 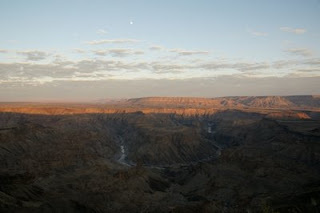 Up very early for our visit to the Fish River Canyon view point past Hobas Camp. We wanted to capture the place at dawn so left in the dark and arrived before the sun got up. There was already a party of French people there before us and more arrived later. It is impossible to capture in words the grandeur of the the sight of the 2nd largest canyon in Africa (the Blue Nile Canyon in Ethiopia is supposed to be larger - we will try to comparelater in the journey). However, we took many lovely photos. Fiver cooked breakfast at the lookout (which was most welcome as it was very cold this morning). We then walked to a second look out a few km away (this replaced our morning run today!). We returned for coffee at the Road House. We took the opportunity to have a planning session as we are getting rather confused and stressed (me from worrying about getting through the trip on time and Fiver not wanting to rush). Fiver pointed out that we had planned for a couple of weeks in Botswana and we probably do not need all of this time so we will take some of it to add a day or two to Namibia so we do not have to miss the main attractions of this glorious country. Due to the early morning we then all had a rest before lunch, after which, Fiver and Merryl went off horse riding at Canon Lodge, which they had booked yesterday. I stayed around the camp and amused myself attempting to take photos of flying birds and identifying ones we had seen already. I was very pleased with the results I got, despite the fading light which meant I had to use a very high ISO number (but all in all a good revision of the relationship between ISO number, focal length and shutter speed}. Fiver and Merryl had booked to go riding at 3:00pm for an hour, so I was expecting them back by 5:00 at the latest. They eventually turned up at 6:15 and I had been getting very agitated. Seems that we did not realise that Namibia was one hour behind South Africa and we had not adjusted our clocks! Also, the ride took longer than planned due to them being given rather wild horses and needing to change them a few times to get ones they were happy with. As it was Fiver had a fall and has a nasty graze on her side and bruise on her leg (in the shape of her camera which, surprisingly, still works!). We cleaned up the graze and put a dressing on it but it is going to be sore. Merryl cooked dinner on an open fire we made on the braai and we spent some time tidying up so we could have a quick getaway tomorrow morning for the drive to Lüderitz. Up at 5:00 (Namibian time). It surprisingly rained a bit in the night and the top of the car and tent were damp. We got away efficiently and had excellent dirt roads on which it was possible to drive at 110kph (once the light was better). Stopped on side of the road for a brew before we hit the B4 main road to Lüderitz. Fiver took over the driving from me then as a way of taking her mind off the pain from yesterday's fall. Long empty tarmac road. We stopped at Aus. A very small place that had a tourist information centre that had a cafe but was very cold. We left after having a pee and went into town to the Banhof Hotel which had been recently renovated. We had a cooked breakfast there. Whilst there, Fiver called a couple of hotels and we got a room for Fiver and I, and a room in the owner's house for Merryl. Continued on to Lüderitz, where we arrived at 11:30. Checked into the Haus Sandrose hotel which is beautifully built around a sunny courtyard. Walked around this strange town with its odd German colonial architecture and bought local Namibia SIM cards. Place was dead after 1:00pm on this Saturday afternoon (just like Germany). Merryl quipped that she thought we were visiting the ghost town tomorrow, not today! In the morning we got up extremely early to watch the sunrise at Fish River Canyon. On our way we intercepted a few hares, long ears flying, and an owl, grey as the dawn. We arrived at the canyon just as the sun turned crimson behind us. From the viewpoint we looked out over a vast range of cliff faces, sloping hills of red rubble sliding inexorably down towards the pale winding river at the centre of the valley. All around us eroding peaks touched by the first light of the day. Slowly, the hot sun appeared over the horizon, the sky changing from washed out grey to pink. The canyon walls lit up in stages, layers of different coloured rock revealed in their crumbled glory. Eventually the walls started reflecting in the still waters of the Fish river as it took on the colour of the morning sky. We walked along the plateau to get another view. The rock under our feet had broken into geometric blocks and flat, shingle-like pieces, red, black and quartz white. To our left the canyon wall fell vertical for a long time, before sloping off in a bed of decayed rocks. At the end of the plateau we discovered the start of the four day hiking trail, a sign warning that no-one is allowed onto the trail without a permit. This is one of the more difficult hikes, and the start was not very inviting, anyway, as it bent steeply down a precarious slope, edged only by a rusty rope. How anyone can carry six days worth of food and equipment and make it to the bottom without a fall I have no idea. In the afternoon Merryl and I went horse riding, And what a ride it was, topping the day with another great adventure. We were an hour early, due to the fact that despite being in Namibia for four days already we had not worked out that it's in a different time zone from South Africa. We have been travelling by the position of the sun in the sky, leaving at first light and stopping as it got dark, so hadn't noticed the change. We were looking forward to a good ride, as we had told the rangers we were both experienced riders - the last few rides I had been on we had been in the company of first time riders and I was ready for a good run. The ranger took this to mean we could handle anything, and gave us two horses that had been left in a field for the last five months, and had forgotten what a ride was meant to be like. They were wild and at the first sign of a flat stretch of dry river bed they were off. All they wanted to to was run like the wind, and they were unstoppable. Unfortunately there came a time when horse and I parted company, and I landed hard, scraping my side, bruising my hip and shoulder and ego. Nothing broken or badly injured, even the camera I landed on survived. I guess 'experienced' was an exaggeration. Nothing for it but more practice. The rush has subsided now that we have hit the deadline of getting ourselves out of South Africa before my visa ran out. We made it to the Namibian border on the last day of my visa. The Namibian border at Noordoewer is a desolate and dusty affair in two parts. Stuart was very nervous as we approached the South African side, as this was our first land border crossing with the carnet, the car's passport that should get it across Africa without incurring customs duties. Incidentally, this was also Merryl's first land border crossing, although she was much calmer about it. The sun blazed down as we were directed to our first stop, South African passport control. There was a long queue in front of us as a large overland safari vehicle has just pulled up and decanted a load of bandanna and shorts youths for the formalities. By the time they were done the guy in the Home Office uniform could not have cared less about our visas and we were gone out of the immigration office in seconds. Next stop customs, which basically consisted in handing over the slip the first guy had given us, and we were off into No Man's Land. 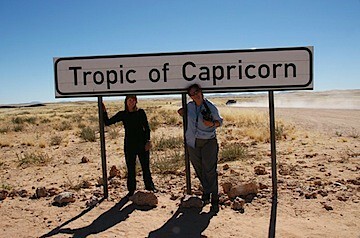 We drove across the bridge past the big sign welcoming us to Namibia. 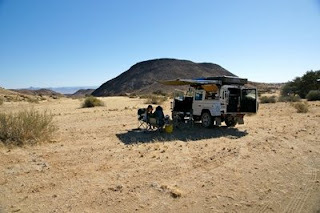 Around the corner from the sign we landed up at the Namibian border offices, again tagging behind the overlanders. We had some discussions with the immigration officials regarding our lack of a local address for our stay and welcomed their suggestion that we would be going to Fish River Canyon - which we were, but not just yet, and definitely not the only place we were staying. Stuart then went on to sort out the car formalities, paid the border crossing fee for the car and we were on our way. So apart from the panic where we had temporarily lost Stuart's inoculation pass (which no-one wanted to see anyway) everything went extremely smooth. No bribes, no hassle, no questions, no muss, no fuss. May all border crossings go this well for the rest of the trip! Cape Town meant an end to our short camping adventure for now, we had to go back into a hotel. After the relatively expensive places we stayed in in Clarens and Cradock we decided to plump for a cheaper option this time, a Formula One. This French chain advertises itself as: "All you need in a hotel room", but neglected to finish the sentence with "and not a thing more". The hotel provided just the basics, everything else was obtainable from vending machines. The room was like a real hotel room that had been vacuum packed into a smaller space. The bathroom is molded from one piece of plastic, shaped around the shower and toilet, and welded into the corner of the room. When you shower the whole unit gets flooded. The bedroom proper consists of a double bed with a single bunk bed stacked sideways above it, reachable by a metal ladder. There is a sink in the corner and a tiny triangular table with an even tinier stool to perch on in the opposite corner. Sleeping in a dorm is always a bit fraught, as everyone tip-toes around trying not to interfere with other people's personal space or offend their evening habits. Then there is the potential for disturbing snoring, coughing or staying up too late and keeping the lights on. Luckily, we have so far not discovered any incompatible behaviour patterns, thus the potential for saving some money on hotel rooms still stands. Unfortunately we needed to use the room as a drying space for dive gear after our visit to the aquarium, too, so with the hanging space under and the rail across the bunk bed the room soon looked like a dive shop, BCDs and regulators, wet suits and booties all spread out to dry. Luckily we were on the ground floor and the car was parked right outside, so we could climb through the window and ferry gear in and out of the room quite easily. It also helped to smuggle the gas stove and kettle as well as breakfast ingredients into the room without having to go past the receptionist. Today one of my dreams came true. We dived in the predator tank in Cape Town Two Oceans aquarium. Ever since I saw the leaflet on my last visit I thought what a cool thing to be on the other side of the window. This is probably one of my favourite aquariums, it has very sophisticated exhibits, lots of information, and the main tanks are beautifully designed and lit. Somehow an aquarium doesn't have that depressingly lonely feel of a zoo, either, although the penguins never look very happy. There are actually two tanks to dive in, the predator tank and the kelp forest. Both seem endless, like a window out to sea, the tantalisingly big fish just happening to appear in front of the aquarium window as we watch them, hypnotised by the movement and speckled light. All morning I was beyond excited. I had no idea what to expect, just that there would be two dives, the predator dive and the kelp dive. Matt, our dive leader, took us to the tanks in the darkened exhibition space and explained the process, how to behave around the fish (keep your distance from the sharks, the rays won't sting, so you can let them touch you; watch the turtles, they may snap; if you get tangled in the kelp, don't yank it out) and what we would be doing (you can look for shark teeth in the sand - sharks can lose up to 40000 teeth in their life time -, we will feed the fish from a bag of pilchards, swim around at your own pace, don't get lost). Next we went behind the scenes. To get into the tank we had to climb onto the roof of the building, where the aquarium is open to the elements. The tanks are covered with blue tarps to prevent evaporation. There was a big old rusty pump to simulate the swell in the kelp tank, rushing sea water into the container every now and then. A platform stretched across the water surface down some rickety steps to get into the water. It all looked pretty ramshackle from here, with old pipes and flaking white washed walls, compared to the controlled environment below. There was a real feeling of smoke and mirrors, feet furiously paddling below to maintain the calm elegance of the exhibition. We first went into the predator tank, as the water was slightly warmer at 18C. Getting into the water was easy, we just ducked under the tarps, slipped off the platform into the water and dropped past the shark circuit - they like to cruise closer to the surface. And then we were in the aquarium. It was actually only 5 meters deep, but as with all dives, once you lose sight of the surface, the rest of the world becomes a theoretical location to return to by necessity rather than choice. 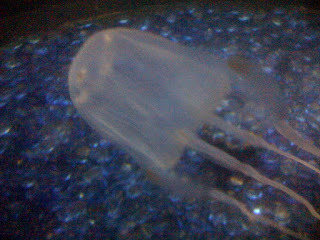 In the water the surface is irrelevant compared to the strange and amazing world around us. Here were large wrasses, yellow tails, sting-rays in increasing sizes, ragged-tooth sharks and turtles. And amazingly, here in front of us, was the window. People were staring, waving, pointing, at us - and the fish we had joined on the other side. It was eery to be here, not on the side of the air breathers, that despite of all the equipment I needed to sustain myself down here, I was now one of the aquatics. We really just spent the time swimming around, watching the rays pass us - the large ray had a habit of slowly passing flat along the glass with it's underside to the viewers, a very elegant move executed with a simple swish of the wing. Occasionally a shark would grace us below, still above us so we could marvel at the row of very pointy teeth. An old turtle mostly sat in a dark corner, giving off a depressed and resigned air, while the smaller turtle hung around, liking to have its underside scratched by Matt. Our second dive took us into the - colder at 14C - Kelp tank, housing large schools of sea fish, a small shark and lots of sea anemones, From the outside it is fascinating, brown fronds swaying back and forth in the water, schools of silvery fish moving past the window, beautiful. Once in the tank it was a bit more confusing. Despite being only 12x12 meters, the rocks and kelp make the space disorienting, as we swam around new spaces revealed themselves, new angles and views. We had a chance to feed frozen pilchard halves to the fish in this tank, unlike the predator tank it was actually safe to do so here without the danger of loosing a finger, these fish being less aggressive - and having smaller mouths. Nevertheless there was quite a bit of jostling and nudging when the food appeared. One large wrasse in particular , a real bruiser, all shiny and silver, just snapped half a pilchard out of my hand. It disappeared without a trace. The smaller fish were a little more dainty, taking bites off the snack held out to them. Stuart has done a delectable job getting these shots. 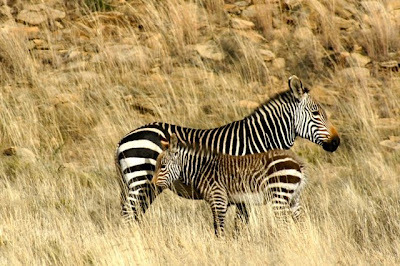 They are from Cradock, Mountain Zebra National Park, Stormy River, the Karoo, Bontebok Park and Cape Aghuilas, and more. If not everything uploaded completely, forgive me, I am currently back to paying for my Internet by the minute. If it's all there, I take full geek credit. Enjoy! Up very early. Merryl woke us and then went off to the gym for a final swim in the pool. Fiver and I continued working - she concluding the Bourse Consult website design work and me sending out email to all our friends, family and colleagues, and then buying the health insurance we need for the trip. We are all a little stressed which is not surprising. Owner's representative and agent came soon after 8:00 to check over the flat - they seemed happy but we are down a teaspoon and some glasses! Sicelo (cleaner) arrived soon after and started collecting together the stuff we do not need or cannot take with us. Then the packers arrived to pick up the stuff for Germany. Good news is that the volume was just about what had been estimated and quoted for. Took Merryl off to the Travel Clinic for her last rabies jab and then back to Melrose Arch. Continued packing until 12:00 then off to JB's for final lunch. Joined by several friends. All these good-byes are making us very sad. We returned for final, final packing and for me to finally do some talking to camera in front of the big map (why did we not do this week's ago?). Then all was finally done and we headed for the car. We had decided, after a lot of discussion, to head for Clarens. 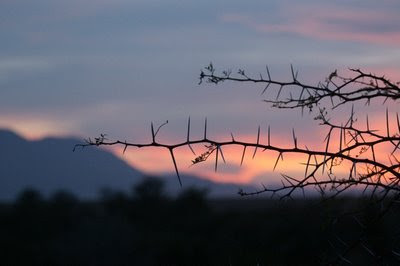 This trip is a tour of Africa, not South Africa, which is much easier for us to visit than most other African countries. Therefore, we are taking a more direct route to Cape Town and will try to be out of the country before Fiver's visa expires on the 7th. Clarens is only 3 1/2 hours away so is a relatively easy trip. We left home just after 2:30. We filmed us leaving Melrose Arch and then headed for the Freeway south. On the slip road we were pulled over by a car with a guy in the back seat flashing what looked like a police badge. We stopped and the guy came over and again flashed the badge, but not very close to us. He claimed he was looking for 2 Dutchmen who had heroin and he started feeling me, smelling my penknife, wallet, Fiver's bag etc. He asked about how much cash we had etc. All very strange but he soon gave up and went on. We think he was a con. Great start to the trip! We battled on out of town and took the N3 south and then on back roads to Bethlehem and then Clarens. We had booked ahead to a B&B and got a self catering apartment. It was expensive but convenient. We got a huge place but it was not warm and the open fire was disappointing (i.e. the logs seemed to have been treated so that they would not burn!). Had nice dinner of mushroom risotto and then worked out route for tomorrow (heading towards Addo). Agreed last night to leave at 6:00 but Fiver did not realise that this morning. She had a bad night and really did not want to get up and was very upset. We packed up the car and left around 6:30. The dawn was lovely as we drove West along the northern border of Lesotho. We had planned to go all the way to Addo which is over 800km and it was possible to make good time on the empty and pretty straight roads. 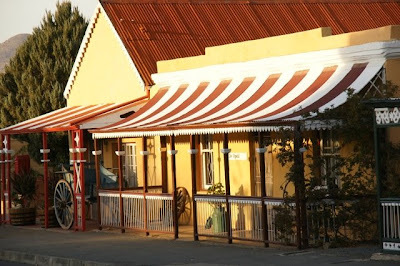 We stopped for tea a couple of times but Fiver was unhappy about the rush to Addo so, when we stopped to get some supplies in Aliwal North, I called ahead to Cradock and got us booked in at the Tuishuise - An hotel that owned most of the street of old artisans' houses. We got there around 2:00 and were shown a property called 'Butlers' which was quite amazing - 3 bedrooms, 2 large reception rooms and a main bathroom with a very large old bath, all furnished with antiques! The only negative point was that the place was freezing cold! We had lunch in the garden, where we were adopted by a local cat, and then everyone went for a nap (or a bath in my case). Afterwards I lit the fire and we sat around the fire doing our own thing. Dinner was a buffet at the main hotel (Victoria Hotel) which was pleasant but, again, the room was not particularly warm. We returned to the house and got the fire going again. The cat joined us and fell asleep on Merryl's lap. We agreed to get up at 7:00 - for Merryl and I to take photos during the golden hour and for Fiver to do some repacking of the car to make it more comfortable. We got out around 7:30 but the light was still a bit low. Fiver moved the car from the hotel car park to outside the cottage to start the repacking. When Merryl and I returned after a half hour or so (with several photos we were happy with), we all went for breakfast at the hotel, which was pleasant and at least warm! We then spent over an hour repacking the car but it was well worth it - much more comfortable. After settling the bill we set off around 10:30 and headed out to the local 'Mountain Zebra Park' - home to the endangered Cape Mountain Zebra, which is distinctively different from the more common Burchell's Zebra. We were lucky and, besides the Zebra, saw Springbok, Gemsbok, Blesbok, Kudu, Red Hartebeest, Ostrich, Vervet Monkeys, Chacma Baboons, Black Wildebeest, a Secretary Bird and a Blackbacked Jackal. We spent around 3 hours in the park in all and then headed out towards Addo. We called the Addo Elephant National Park but it was fully booked. However, we found accommodation in Addo itself at a place called 'Homestead'. We went shopping in Addo for dinner; the shop, which was attached to the petrol station, was pretty basic, but we found a lot of what we wanted. We drove to the campsite and set up tent. This was the first time that Merryl had pitched Mark's tent that he had lent her for the trip. Her and Fiver did it together and got it all to work, as I set up the roof tent. Merryl then cooked lovely dinner of corn fritters. 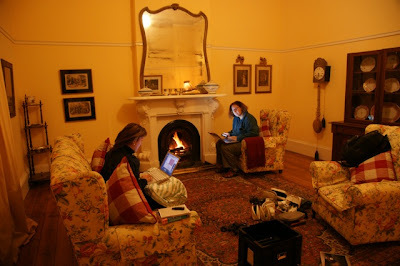 We spent rest of evening blogging, downloading photos etc. Up at soon after 6:00 again. Had some tea and did some packing up until it was light enough to see and then we went for a couple of kilometre bush walk, watching the dawn break over the park. A very pleasant change after all the driving of the last few days. 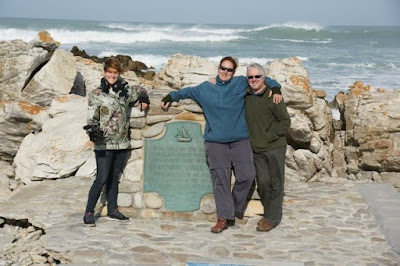 I cooked eggs for breakfast and then we cleaned up the camp and drove off towards the first objective of the trip - Cape Agulhas, the southernmost point of Africa and the traditional starting or ending point for trans-Africa journeys like ours. After finding some yummy fish and chips for lunch we drove off to Cape Town where we booked ourselves into a Formula One hotel near the waterfront for a couple of days as we do some diving and get ready for the trip north to Namibia.